Just Julie B's Stampin' Space: Flourishing Phrases Cards & Memories Gift Set! The Cards and Memories Gift set is a great gift idea to bring for the Hostess of your next New Year’s Eve Party event, what a nice way to start the New Year than with a fresh new set of cards and a photo album to showcase your favorite moments. This is a very easy to reproduce project and great for your next Class or Workshop, you can also make one for a Birthday Gift or any other occasion. 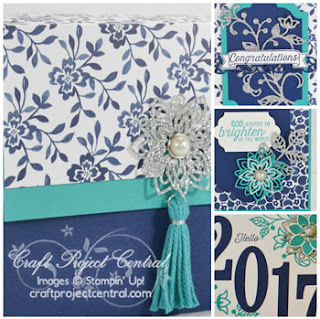 The Flourishing Phrases Cards and Memories Gift Set tutorial includes four cards of different occasions and one accordion style photo album all this packed in a beautiful keepsake box. In this tutorial you will learn how to build an easy keepsake box with a magnetic closure, how to make your own tassels and embellishments, how to quickly create a cute photo album and a set of cards. This pretty project was made by Olga Cavanuagh and you can get her tutorial when you subscribe to the month of December over at Craft Project Central.